Searching for the best selection of men’s and women’s running Shoes in Long Beach, CA? At Lucky Feet Shoes of Long Beach, we carry many running shoes support types from stability, motion control and cushioned. Therefore, keep reading for a detailed list of some of the most comfortable running shoes in Long Beach. Made in the USA, the New Balance 990 running shoe is the perfect shoe for runners seeking comfort, quality cushioning, and stability. With a breathable pigskin suede upper, dual-density collar foam, and ENCAP midsole technology; this men’s and women’s running shoe offers a perfect combination of cushioning and stability. Overall, the 990’s are good cushioning shoes with both arch support and heel support. Encap PU ring with EVA (Ethyl Vinyl Acetate) core. Manufactured in the US for over 75 years. The Adrenaline GTS is one of the most popular running shoes in Long Beach as they are an excellent choice for the runner seeking perfect balance, reliable heel support, and extra cushioning. It provides softer cushioning, increased flexibility, and seamless heel-to-toe transitions to keep you running in comfort. Its midsole’s diagonal roller and full-length segmented crash pad help promote long controlled runs with reduced shock to your muscles and joints. In addition, the structured saddle pulls from the heel and wraps around your midfoot for a secure fit and its Progressive Diagonal Rollbar technology ensures your body’s in proper alignment every step of the way. No-sew upper with new material wraps the foot and adds support. Mesh toe-cap increases breathability and airflow. Moisture-managing element mesh ensures your feet stay cool and dry. BioMoGoDNA is lightweight and conforms to your foot for a personalized fit. Progressive Diagonal Rollbar in the midsole counteracts your foot’s tendency to overpronate, smoothing transitions. Omega Flex Grooves bend with your foot movement for great flexibility and support. Deeper v-grooves allow for the extra lateral release and promote a smoother ride. Built for runners with comfort in mind, the Brooks Beast men’s running shoe was built with a sturdy construction and superior comfort.Its tuned density midsole and an extended Progressive Diagonal Rollbar controls pronation to better align your joints throughout your stride, while the full-length Segmented Crash Pad accommodates any foot landing, delivering smooth heel-to-toe transitions. In addition, the shoe’s Super DNA technology softens the impact with adaptive cushioning. Overall, the Brooks Beast provides top-of-the-line motion control running shoe built for the moderate to severe over-pronator who requires stability and cushioning. This Brooks Beast definitely one of the best running shoes in Long Beach. Wide fit; Padded tongue and collar for added comfort. BIOMOGO midsole provides the long-lasting plush you have come to love. Full-length Brooks DNA midsole adapts to your stride for custom cushioning and stability. Moisture-managing element mesh upper and linings for excellent breathability. Ultimate sockliner and support saddle provide comfort and protection. Conformable Saddle Construction improves fit and structure of the upper. Extended Progressive Diagonal Rollbar in the midsole counteracts your foot’s tendency to overpronate, smoothing transitions. Full-length segmented crash pad absorbs shock at the heel, disperses it through toe-off. Omega Flex Grooves bend with your foot movement for great flexibility. HPR Plus, abrasion-resistant rubber outsole for durability. Just like the Beast, the Brooks Ariel is built for runners with comfort in mind, the Brooks Ariel women’s running shoe was built with a sturdy construction and superior comfort.Its tuned density midsole and an extended Progressive Diagonal Rollbar controls pronation to better align your joints throughout your stride, while the full-length Segmented Crash Pad accommodates any foot landing, delivering smooth heel-to-toe transitions. In addition, the shoe’s Super DNA technology softens the impact with adaptive cushioning. Overall, the Brooks Beast provides top-of-the-line motion control running shoe built for the moderate to severe over-pronator who requires stability and cushioning. This Brooks Ariel definitely one of the best running shoes in Long Beach. This New Balance 1080 is very smooth and delivers a great cushioned experience in every run. This shoe is designed with the runner’s comfort from top to bottom for a fresh experience. In addition, a breathable engineered mesh upper with a molded foam collar and a no-sew bootie fit offers an extra snug-feel, while New Balance’s signature Fresh Foam midsole technology provides advanced cushioning mile after mile. Altogether, the New Balance 1080 is great for runners with medium arches. OrtholitePremium insole provides additional cushioning for arch support and durable comfort. The Brooks Dyad running shoe is ideal for runners with flat or medium arches that need good cushioning in their shoes. It has a soft and stable platform and well-cushioned underfoot. They are great for runners looking for a little extra support in a neutral platform. With Brooks’ Biomogo DNA Midsole Cushioning, a heel segmented crash pod and dual stability arch pods, runners will have a comfortable experience. In addition, Omega Flex Grooves allow for more natural forefoot movement and fluidity. This shoe is ideal for mild to moderate overpronators and is one of the best running shoes in Long Beach for runners. Mesh upper has moisture control attributes that keep the foot cool and dry. Adjustable saddle construction for a custom fit. Omega Flex Grooves for flexibility in every stride. Heel Segmented Crash Pad for powerful take-off and soft landing. BioMOGO midsole cushioning technology is lighter than traditional EVA with significantly less environmental impact. No Sew upper overlays eliminate friction points and fit better. The News Balance 1260 is a great option for overpronators, delivering premium stability and superb cushioning without sacrificing style. This New Balance shoe maintains the support you need while upping the cushioning with a nitrogen-infused FuelCell midsole. Overall, this shoe provides optimal stability but offers a unique ride allowing great energy distribution on landing and liftoff. The Brooks Ghost 10 is a neutral road running shoe that delivers both comfort and performance. It creates a lightweight fit and feel with engineered air mesh and minimal weight throughout, and features 3D Fit Print overlays for a more consistent, supportive fit. In addition, its BioMoGo DNA midsole cushioning adapts to your stride for plush comfort underfoot, while flex grooves optimize forefoot flexibility. In essence, the Ghost is designed to handle even your toughest training runs. Scorpius running shoe provides stability and support utilizing WaveSpring technology. Its WaveSprings provide superior cushioning and comfort, which help to protect your feet and joints against impact, stress, and fatigue. This unique technology works as an energy return system that works with the ground by returning the energy back to the wearer; as a result, reducing foot stress and fatigue for an exceptional performance comfort. Returns up to 96% of the energy otherwise lost to the ground. Reduces peak impact forces by 20% to allow people to participate in running or walking activities for longer periods with less stress on the body. No significant cushioning breakdown throughout the life of the shoe. At Lucky Feet Shoes, we guarantee you’ll find the best running shoes in Long Beach. Lucky Feet Shoes of Long Beach is your one-stop-shop for running footwear. Shop our huge selection of running shoes support types from stability, motion control and cushioned. 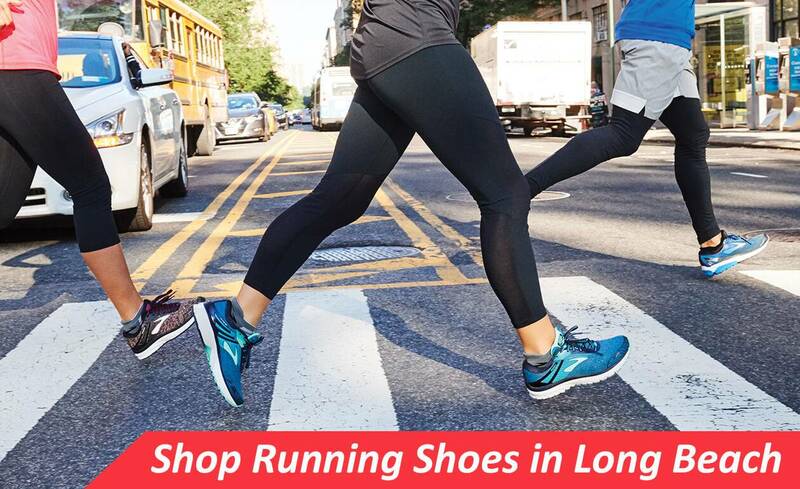 Whether you prefer to shop online or instore, at Lucky Feet Shoes of Long Beach we have a large selection of running shoes. We invite you to stop by for a FREE FOOT ANALYSIS and find the best running shoes in Long Beach for your needs.